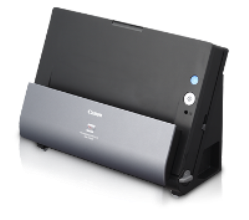 Canon DR-C225W(Wi-Fi) Scanner Built compact without comprising speed or quality with a minimalist design achieved through the elimination of obstructive tray extensions. Combining unique design and innovative features, the DR-C225 offers affordable scanning without compromising on performance. Its vertical U- turn Path transport system means the DR-C225 has one of the smallest footprints in its class. Various types of documents can be easily scanned with two ejection path. U-turn path scan and eject standard-paper documents without using additional space. Straight ejection path for thick document sheets, driver's licenses and ID cards can be easily switched by flipping the lever. Compact and small in footprint.